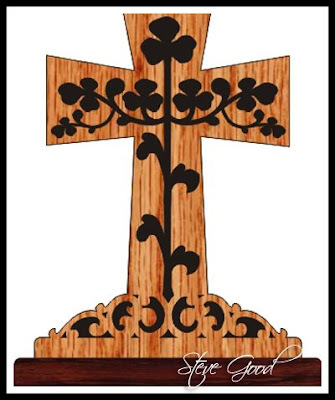 Here is a simple scrolled cross. It stands about 8 inches tall. The cross stands on an oval base. I hope you enjoy cutting this pattern. I have a gripe tonight. I had a 21 inch flat panel monitor just now die. It's a Gateway FPD2185W. This is the second one of these monitors I have had die in the same way. They last a little over a year then just go blank. These were very expensive monitors. $500!! I also have a 22 inch Gateway monitor and I guess it will probably go the same way. Just passing this along in case any of you are looking for monitors. I sure can't recommend Gateway. The one that died was on my video editing computer.